The Victory Magnum is facing a competitive future. Photo by Jesse Kiser. It's a generally accepted principle that brands succeed based on two broad assumptions: they have the ability to evolve as the nature of their business and their consumer evolves (think Apple) or they produce a product that is so beloved and even culturally ingrained that to change it would be foolish (anyone remember New Coke?). Very few brands fall into that rarified second category; most have to change or they'll end up withering on the vine. Nowhere is that more true than in the motorcycle industry. And no motorcycle brand exemplifies this more than Victory. These days, it seems that Victory Motorcycles is at a (pardon the pun) crossroads, at the intersection of Evolution and Stagnation. I have a fondness for Victory bikes – without them, you probably wouldn't be reading this. Full disclosure: my motorcycle writing (and riding) career, such as it is, started with a job writing content for the Victory website. I wrote a bunch of feature articles about Victory bikes for the Victory website, and gained a real appreciation for both the precision engineering that went into them and the loyalty felt by Victory riders toward the brand – loyalty that was earned, in my opinion, as the bikes were and remain superior to the ones produced by Harley-Davidson, the company that Victory had placed in their crosshairs. It's no trade secret that Victory's aim was to capture at least some of H-D's dominant market share; much of their marketing work was and still is not-too-subtly aimed at Harley riders. This is what most of our readers picture when they think of Victory riders. 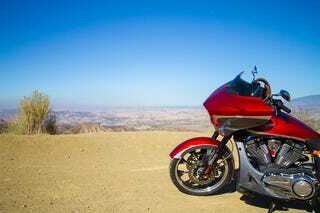 Photo courtesy of Victory Motorcycles. It's an effort that's been marginally successful – of course, saying that you are the second biggest producer of American motorcycles isn't really saying a whole lot, all things considered. And while I do admit to having some pro-Victory bias – it's hard not to, considering that they gave me my first motorcycle writing job – at this point, I'd never consider buying one of their bikes. So in that light, I'd like to propose a somewhat radical alternative to the folks at Victory. Stop trying to compete with Harley. Let's look at what happened with both brands last year. Harley put two brand-new production models, the Street 500 and the Street 750, on the market. That in and of itself was a fairly radical move – the last time H-D rolled out an all-new bike was over 13 years ago. Add to that the fact that the Street is squarely and unapologetically aimed at a demographic outside of Harley's traditional target buyer – new, young and/or urban riders. Harley also introduced the LiveWire project – not only is it an electric bike, it's arguably a sportbike, and clearly a radical departure from the traditional Harley stylings. And given Harley's recently announced plans to have the LiveWire project tour Europe and Asia, it's a fair bet that Harley will be putting the LiveWire into production in some form. Victory, meanwhile, introduced the Gunner and the Magnum – basically, two "custom" (and again I'll ask: Can anything that rolls off of a mass production line be considered a "custom" bike?) versions of existing bikes, the Judge and the Cross Country. And Victory actually eliminated the Judge – along with the Boardwalk and Jackpot - from its 2015 cruiser lineup. Gone too are the Cross Roads baggers. All told, Victory dropped five models from its lineup, a net loss of three lines (not including the 15th Anniversary Cross Country Tour model, which was a limited edition bike). Victory is touting the release of a new Magnum variant, the X-1, which will be unveiled at Daytona this March. But that's in line with the standard cruiser business philosophy – same bike, different bells and whistles. It's probably not much of a stretch to see what Polaris, Victory's parent company, is thinking – Indian is a hot brand right now, and Polaris is putting more of its eggs into that venerable basket. But where does that leave Victory? I have a few suggestions. Look to the Vision: Victory launched their Vision touring bike in 2007, and it remains one of the most visually striking bikes on the road today. Not only does it not look like most other bikes out there, it doesn't look like anything else in Victory's own lineup. And that look is something that Victory should build on. Victory found a sweet spot with the futuristic Art Deco look of the Vision; applying a similar aesthetic to new models would further separate them from Indian and Harley, and make the bikes more appealing to riders who are looking for something different. Go Smaller: There's certainly a growing demand for small-bore bikes as the new rider market grows. That doesn't mean that Victory needs to build a 250, but it could certainly do well by putting Polaris resources into building an engine comparable to Harley's Revolution X. An engine in the 500 to 750 range would appeal to a wide variety of riders – and it would presumably give Victory a bike that would offer a cheaper option to potential buyers. Right now the lowest price Victory models come in at $12,999. Build an Adventure Bike: You're owned by Polaris. They know a bit about build machines that go off road. EBR has hinted at producing an ADV bike, but is there a brand better positioned than Victory to be the first major American ADV manufacturer? Go Electric: Polaris recently bought Brammo, so the odds of this happening are pretty good. But throwing Brammo and Polaris resources at a Victory-branded electric bike just to say that Victory built one isn't going to cut it. If Victory truly wants to break the mold, they'll need to build an electric bike that actually has mass appeal – and that means decent range (right now the LiveWire can only go about 50 miles on a charge) and performance at a price that's at least in line with their other models. READ MORE: Is Victory Building an Electric Cruiser? There's never been a better time for Victory to do some soul-searching; European and Japanese builders are continuing to push the motorcycle envelope, while the two major American companies are mired in the past, with nostalgia serving as their only inspiration. Victory will never be Harley, just as Pepsi will never be Coke. But Victory can be something unique, if they choose to. This article was written by Jason Avant.